Everywhere you look at the moment whether it be the television, magazines or social media sites, you can't escape seeing pictures of celebrities and models in Tartan which seems to have become a big trend! The best thing about Tartan is it seems to be flattering to everyone. 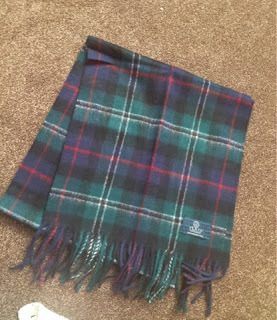 I was asked to review a tartan scarf from buyakilt.com who specialise in all things Tartan. I was given the choice from their HUGE selection of scarves and chose the Rose Hunting Modern Tartan Scarf. When the scarf arrived I was amazed at the fantastic quality. It feels lovely to touch and the pictures just don't do it justice. It's now my first choice of scarf when I'm off out. With a choice of over 120 tartans available and prices starting at £11.88 (the one I chose was £11.88). I think the price is great for the value and they would make great gifts for men or women of all ages. I'm pleased to announce that as well as being kind enough to send me a scarf to review, I have been given one to giveaway to one lucky reader. The winner will get to choose their choice of scarf from the scarf collection here. Open to UK only. The competition will end 05/03/2014 at 12am. All entrants must complete the mandatory entry on the rafflecopter form. Those who don't will have all entries removed. The blog owner will choose the winner through the rafflecopter form (which uses random.org) The winner will be notified by email and displayed on the widget. One winner will receive a prize of their choice of scarf from the buyakilt website. No alternative prize will be offered. Please allow up to 28 days for delivery of prize. I love the McBeth modern tartan scarf. MacKenzie Ancient is a lovely combination of colours. Macleod dress modern scarf is beautiful. Freedom Tartan Cashmere Scarf - love the colours! This one is colourful and would go really well with my coat! I like the Anderson Modern Tartan Scarf. Cornish National Tartan Scarf - I love the green colours! It would go perfectly with my pink coat too! http://buyakilt.com/murray-of-atholl-modern-tartan-scarf - this is my favourite! I LOVE the Buchanan Antique Tartan Scarf - it's gorgeous! Not sure - they're all so good! http://buyakilt.com/macleod-dress-modern-tartan-scarf Love this one because it is bright and something a bit different. Couldn't see the Boyd tartan which would be my number one choice. I would buy the Campbell Clan Ancient Tartan Scarf (http://buyakilt.com/campbell-clan-ancient-tartan-scarf) I love that shade of blue. I would choose the murray scarf, as that matches my name. 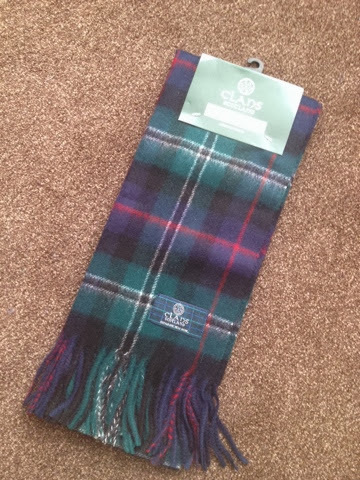 http://buyakilt.com/murray-of-atholl-modern-tartan-scarf Looks toasty warm! Cornish National Tartan Scarf - love this one! They're all so lovely it's difficult to chose just one favourite!